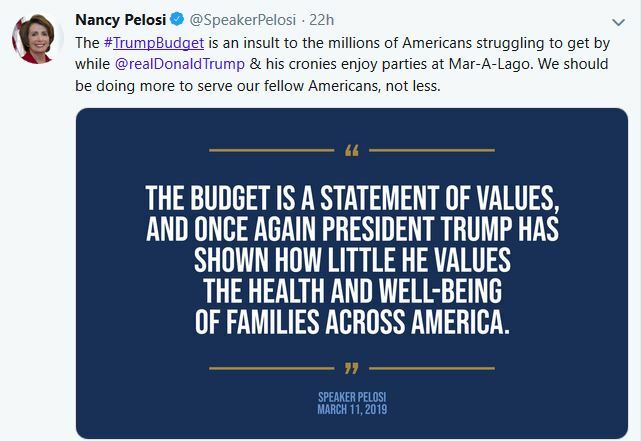 (CNSNews.com) - House Speaker Nancy Pelosi (D.-Calif.) sent out at Tweet on Tuesday saying that President Donald Trump’s budget insults Americans who are struggling to get by when Trump and his friends are enjoying parties at Mar-A-Lago. Under Trump’s budget proposal, federal spending would increase by $1.966 trillion—rising from $4.529 trillion in this fiscal year to $6.495 trillion ten years from now in fiscal 2029. Over the next four fiscal years, under Trump’s proposal, the deficit would exceed $1 trillion each year. From the end of fiscal 2018 (last September) until the end of fiscal 2029 (the end of September in that year), the total federal debt would rise from $21.463 trillion to $31.506 trillion—an increase of $10.043 trillion.